These days we really never know what we're going to see on The Tonight Show with Jimmy Fallon. You are, however, always guaranteed a good laugh. Should you find yourself a guest on the show, though, be prepared! Jimmy Fallon has taken to offering style tips to his guests and Jared Leto was the latest to fall victim to a Jimmy makeover. 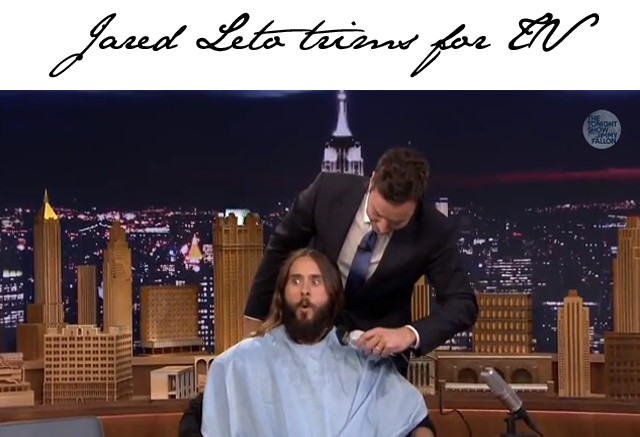 Seems Fallon wasn't too crazy about Jared Leto's overgrown beard. So he threw on a robe and took the shears straight to the facial hair, leaving Jared clipped and ready to sing with a lighter load. Check it out.